A low vision examination should detail the kinds and the quality of visual deficits afflicting patients and how they are adapting to their vision loss. 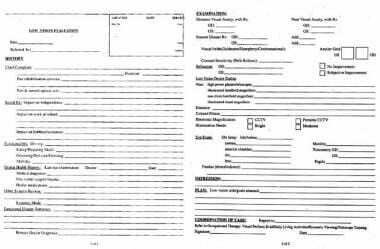 This may include a chief complaint, as well as social, functional, and ocular health history as detailed in the sample examination form (see image below). 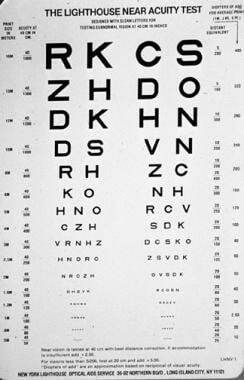 Low vision acuity and refraction often requires such nonstandard acuity measures as the Feinbloom low vision chart with numerals in the size range of Snellen 700 to 10. Distance acuity often is measured at varying distances (eg, 10 ft, 5 ft). Trial lens refraction is recommended to ensure accurate vertex distance to allow for eccentric eye or head position. Near acuity is measured at 40 cm (ie, 0.40 m) with the patient's correction in place, with +2.50 D add if the patient is presbyopic. The add power needed to read average size print (ie, 1 M, 20/50 Snellen equivalent, Jaeger #5) is calculated by taking the reciprocal of the near acuity. For example, a patient reading 4 M print (20/200 Snellen equivalent) at 40 cm would require a +10 diopter (D) add to read 1 M print (1/0.40 m/4 M). One option to speed up the add calculation is to use the Lighthouse Near Acuity Test chart (at 40 cm test distance), which includes precalculated adds for each acuity (see image below). To determine the necessary magnification, divide the best-corrected acuity by the desired acuity. For example, the best-corrected acuity is 20/200 and the desired level of acuity is 20/40, so the required magnification is 5 X (200/40). Various forms of low vision therapy can increase the patient's ability to perform work, leisure, or daily living activities. In patients with low-to-moderate vision loss, the near acuity often can be improved by increasing the bifocal add alone. However, bifocal powers greater than +5.00 D may impede mobility. Hence, separate glasses with a more moderate add may be necessary, in addition to the high-powered readers. Also, demonstrating the reduced focal distance (closer working distance) of high-add prescriptions helps to educate patients so that they know exactly at what distance the reading material should be held (see image below). Excess convergence demanded by add powers greater than +4.00 D can be relieved by the use of a base-in prism, 2 more than the diopteric power of the add per eye. For example, +6.00 D glasses would have 8 prism diopters base-in for both eyes. Standard prism half glasses are available in +4, +5, +6, +8, +10, and +12 D powers. Optimal illumination with the light source directed at an angle of 45° to the page, and over the shoulder of the better eye, minimizes glare. The advantage of high-add readers is that they leave hands free and are familiar to patients. The primary disadvantage of these readers is the need to train patients to use a much closer reading distance. Microscopes typically are used when the needed add power is greater than 12 D. Because of the greatly reduced focal length, microscopes often are prescribed monocularly (see image below). Microscope aid used monocularly at close working distance. In contrast, near telescopes allow the patient to read at a more natural working distance. Near telescopes, like surgical telescopes, have a narrow field of view, but they can be manufactured to focus at any working distance. However, good motor control is essential to maintain the reading material within the field of view. To achieve full magnification, handheld magnifiers should be demonstrated with the patient's distance correction in place. The demonstration should begin by placing the magnifier on the page and, then, slowly raising it until the image is at the maximum magnification. Although handheld magnifiers provide greater magnification than high-add readers and allow for a greater reading distance than microscopes, they require good motor control to be used effectively. Hence, handheld magnifiers often are suggested for short-term reading tasks, such as checking prices in a store or reading items on a menu. See the image below. 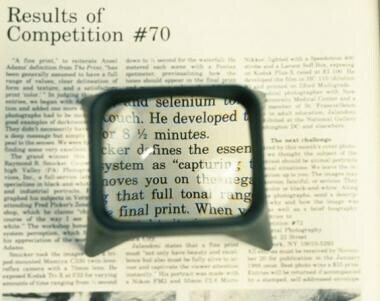 Stand magnifiers are similar to handheld magnifiers, but they have a base that is used to rest the magnifier on the reading page (see image below). Stand magnifiers require less motor control than handheld magnifiers and allow for a greater working distance than high-add reading glasses. Moreover, illuminated stand magnifiers can provide the patient with direct illumination of the reading material. 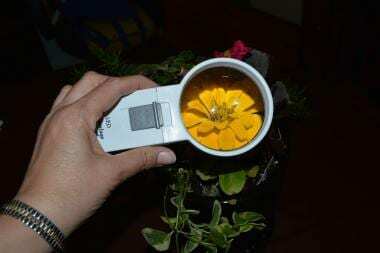 Stand magnifier useful for patients with poor dexterity. Fixed-focus stand magnifiers are designed to be viewed at a distance of 40 cm and require a reading add to bring the image into focus. Patients often may wish to use a greater add power than the standard +2.50 D to reduce the working distance and to gain a wider field of view. They provide the clearest image when the patient sights the object on axis. 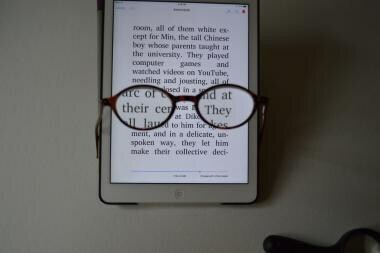 An off-axis view of the object through the magnifiers often produces a distorted image and results in reduced reading facility. If the patient desires to write or sew under the magnifier and has only moderately impaired vision, then an illuminated stand magnifier mounted on a flexible arm can be used. One such device is the big eye magnifier with a +3.00 D or +6.00 D lens. Stand magnifiers are especially useful for patients who have glaucoma or retinitis pigmentosa with restricted visual field. 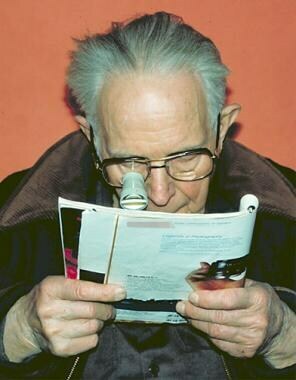 For such patients, the reduced field of view provided by the stand magnifier often results in better scanning skills while reading. The 2 most common reasons for patients to reject these devices are postural fatigue from having to bend over the magnifier and difficulty with manual manipulation of the magnifier. Although practice makes the device more manageable and an adjustable light source with clipboard can improve the posture, patients may prefer the larger field of view provided by closed-circuit televisions (CCTVs) when reading for an extended period of time. Telescopes are typically in clear focus for objects viewed from a distance of 20 feet or more. The doctor should prefocus the telescope on a distant object. The telescope should be aligned by focusing a penlight beam through the telescope onto the patient's pupil. 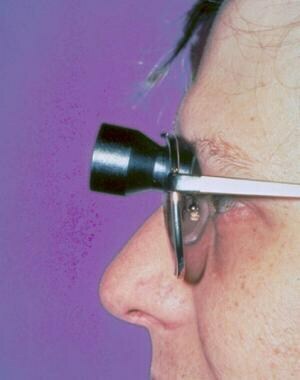 The lowest possible magnification should be chosen to meet the patient's needs, thereby keeping the field of view at a maximum. The patient should wear the prescribed correction or have it placed within the lens of the telescope. Improvements in telescopic systems include the ability to adjust for distance, intermediate, and near vision. Furthermore, increased fields of view and decreased weight allow patients to increase their reading duration and rate. The Mini Pencil, a 5 X 10-inch telescope, allows patients to spot objects at intermediate and longer distances. The small size and weight allows increased use to the patient as well as storage capabilities. Hand-held telescopes are useful for short-term spotting tasks. They are small and inconspicuous and often are prescribed monocularly. Clip-on telescopes are usually monocular. They are useful when patients need their hands to be free. Patching the other eye is helpful when learning how to see with a clip-on telescope. Bioptic telescope allowed for driving in some states. Sunglasses are used to reduce the symptoms of glare and photosensitivity. Corning SPF series are useful, especially for patients with macular degeneration, ocular albinism, and glaucoma. They are more costly than the other forms of sunlight protection. Unlike conventional sunglasses, the top and sides of NOIR sunglasses shield the patient from excess light. NOIR sunglasses are available in many hues. NOIR 711 is most helpful with macular degeneration. They cost much less than the Corning SPF series. Current technologic options are aimed at universal accessibility: reading or listening in variously sized fonts or volumes. This concept, in which a person with 20/20 vision may want to listen to a book in the car or use email while walking on a treadmill, has led to a surge in tablets, monitors, computer programs, and applications that assist all in accessing information and communication. While optical correction such as higher-power prism readers (see images below) or handheld magnifiers (see image below) are still used, lenses can now be combined with larger or contrast-enhanced font presentation. 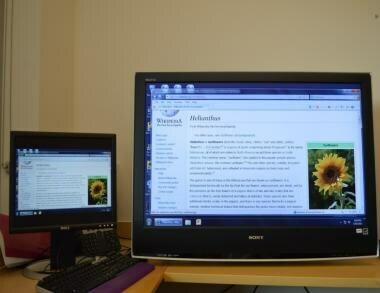 A computer may be plugged into a large monitor, such as in a 42-inch television (see image below). The text on the screen is 3 times larger even before adding computer program enhancement such as Zoomtext or other enlarging enhancing software options. Appropriate reading glasses may be added, with a net add of +2.00 D for 0.5-meter viewing distance or a net add of +1.50 D for 0.66-meter viewing distance. Large monitor. A computer may be plugged into a large monitor, such as in the 42-inch television pictured. The text on the screen is 3 times larger even before adding computer program enhancement such as Zoomtext or other enlarging enhancing software options. One of the most reasonably priced options for electronic magnification is the portable electronic reading aid by Mattingly. The pinhole style camera is plugged into the patient’s home television. Zoom magnification is available, along with enhanced contrast and reversed polarity, white letters on a black background. The handheld unit pictured below is currently in the $200 range. 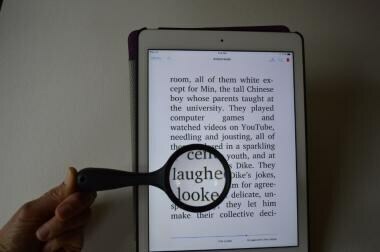 Portable electronic magnifier system. One of the most reasonably priced options for electronic magnification is the portable electronic reading aid by Mattingly. The pinhole style camera is plugged into the patient’s home television. Zoom magnification is available, along with enhanced contrast and reversed polarity, white letters on a black background. The handheld unit shown is currently in the $200 range. The complete CCTV system pictured below has the screen attached with excellent lighting conditions. The standard CCTV allows patients to write or do an activity requiring two hands under enhanced magnification. The costs for CCTVs currently range from $2000 to over $3000, depending on the monitor size and additional features such as a swivel camera that can be aimed at a distance as well as near. 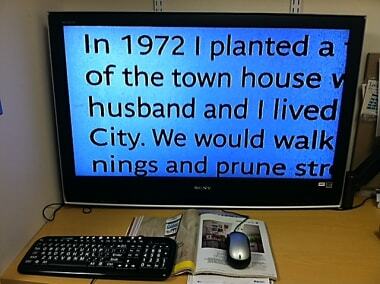 A new CCTV option includes text to speech, and the patient may read in a large font or scan and listen to the information. Complete closed-circuit television (CCTV) system. The complete CCTV system pictured has the screen attached with excellent lighting conditions. The standard CCTV allows patients to write or do an activity requiring two hands under enhanced magnification. The costs for CCTVs currently range from $2000 to over $3000, depending on the monitor size and additional features such as a swivel camera that can be aimed at a distance as well as near. 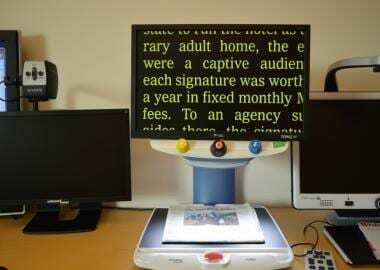 A new CCTV option includes text to speech, and the patient may read in a large font or scan and listen to the information. 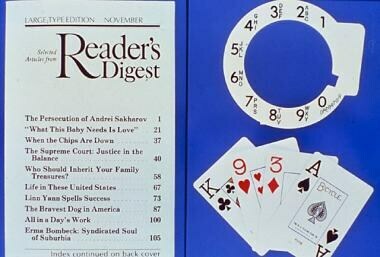 Large print material, such as the New York Times, and the Reader's Digest (see image below), allow patients with low-to-moderate vision loss to read with greater facility. Tablets and computers also provide access to larger font sizes. Large print material used for patients with low-to-moderate reading impairment. Dial markers offer tactile cues for patients to set gauges on ovens, washers, dryers, and thermostats. Self-threading needles allow patients to thread a needle without seeing the needle eye. Books on tape (talking books) allow patients to keep current on a plethora of topics and to compensate for the lost pleasure of reading. Talking clocks and watches help patients to keep time verbally. Check signing and writing guides are stencils with openings cut out to allow the patient to write the date, amount, or signature without writing above or below the line. Free telephone information calls are provided by most telephone services to patients who send in certification of visual impairment. Descriptive video service provides narrated descriptions of visual elements (eg, actions, costumes, gestures, scene changes) in program. Financial benefits: Patients who are certified as legally blind may be entitled to an extra exemption on their state income tax form and/or a higher standard deduction on their federal income tax form and may qualify for social security disability insurance or supplemental security income benefits. In some states, handicapped parking permits are provided to visually impaired people with certification of visual impairment from an eye care practitioner. Count-a-dose devices assist patients in obtaining the correct number of medications. 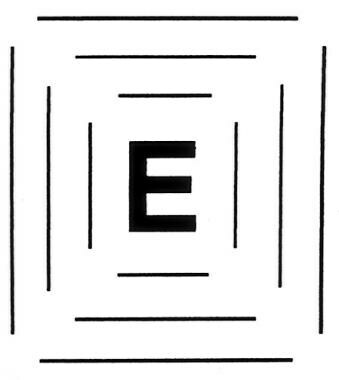 The boxed "E" (see image below) is used to determine where the patient needs to look to see the E most clearly. That area is marked on the box with an X. This is the eccentric viewing position. Eccentric "E" used to retrain fixation away from a central scotoma. Next, the patient is instructed to practice looking away and, then, back to the X. The patient should move the E left and right, while maintaining fixation on the X. If the E becomes blurred or out of focus, then the patient is instructed to place the E centrally and refixate on the X. The exercise is repeated, while moving the E up and down. Next, the patient has to repeat the exercise with an E that does not have an X or lines to guide the patient to the eccentric viewing position. Improving the contrast between images results in better visual recognition. 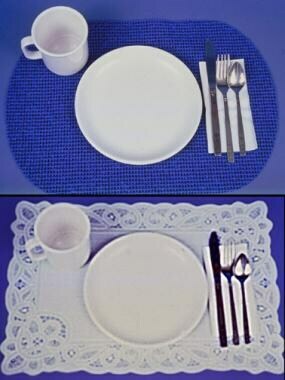 Pouring milk into a white cup against a white tablecloth is one example of poor contrast. Using a different color tablecloth and/or cup can improve the contrast (see image below). Increased contrast helps patients maximize visual recognition. The Implantable Miniature Telescope (IMT), an optical prosthetic device, provides an innovative method of improving visual acuity in patients with moderate or severe ARMD. See images below. Undilated view of Implantable Miniature Telescope. Dilated view of Implantable Miniature Telescope. The device is a fixed focus telescope (2.2X or 3.0X) mounted in a carrier with 2 rigid haptics. It consists of a glass cylinder 4.4 mm in length and 3.6 mm in diameter with a polymethylmethacrylate carrier. This visual prosthetic device enlarges retinal images in the central visual field, enabling patients to improve distance and near visual acuity. However, this also causes a severe reduction in the visual field. The fellow eye is needed to provide peripheral vision. In other words, one eye sees the magnified telescopic view, while the other eye maintains the full field of vision. Each eye is used monocularly, as it is impossible to fuse the 2 images. Patient selection is critical to a successful surgical outcome because of the complexity of the surgery and the postoperative rehabilitation required in adapting to the device. The IMT is appropriate for a small subset of patients. Selected patients have untreatable macular disease, have a fellow eye capable of mobility, and have a cataract. 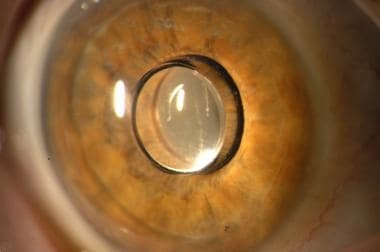 Because of the complexities of the surgery, removing an intraocular lens (IOL) from a pseudophakic eye in order to implant the IMT is not a viable option at this point. Patients must understand the procedure and the expected outcome. To demonstrate the concept of magnified central vision with peripheral vision loss, patients must try on a central telescope mounted in a pair of glasses. Patients need to understand that the 2 eyes will not work together, thereby creating a unique monovision concept. This idea is especially challenging to demonstrate in these patients because of the cataract in the eye that will be implanted. In addition, patients must also understand the pros and cons of this device; they may gain better visual acuity but lose peripheral vision and binocularity. The implantation for the telescope prosthesis is a complex procedure beyond typical cataract surgery. The telescope has larger dimensions than an IOL, and the incision needs to be around 12 mm. A large capsulorrhexis of 7 mm with an intact capsular bag is needed for telescope implantation. 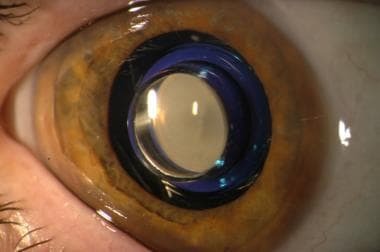 First, the cortical lens material is completely removed to prevent residual cortex from being trapped between the telescope and the posterior capsule. A viscoelastic product, such as Healon, is used in the anterior chamber to prevent damage to the endothelium. Both haptics are placed in the capsule, and the IMT is then rotated to stabilize the device, with the haptics at the 6-o’clock position and the 12 o’clock position. This requires considerable surgical skill because of the size and the stiffness of the IMT. Following surgery, patients require a longer course of anti-inflammatory medications as well as postoperative education/rehabilitation. Postoperative refractive errors are corrected by spectacles. Because of the central position of the telescope, a separate pair of distance and reading glasses or a high-mounted bifocal may be used. A 2-year multicenter clinical trial of the IMT has been completed, including follow-up on 206 patients (mean age, 76 y) who were operated on by 32 different surgeons. [6, 7] All patients had moderate to profound bilateral central vision loss resulting from bilateral, untreatable macular degeneration. The acuity and the visual field in their fellow eye were adequate enough for mobility, since the operated eye was to maintain only central vision. 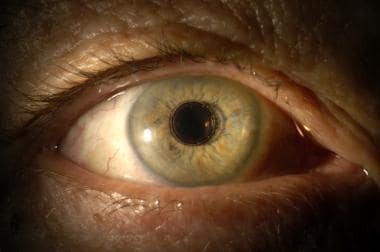 Patients also had significant cataracts in the eye to be implanted. The National Eye Institute 25-item Visual Function Questionnaire (NEI VFQ-25) was used to evaluate changes in perceived visual function in daily living activities. [6, 7] The mean NEI VFQ-25 scores improved 7 points from baseline (p< 0.01), indicating an improvement in vision-related quality of life. The endothelial count is critical, as the IMT protrudes through the pupillary plane by up to 0.5 mm, and telescope implantation is associated with endothelial cell loss. Trial results showed that the endothelial cell count was decreased an average of 25%, mostly occurring in the initial 3 months postoperatively and correlating with postsurgical corneal edema. [6, 7] There was no evidence of further endothelial trauma in the later postoperative period. While aborted surgical cases or operative complications occurred, 192 of 206 patients still participated in at least 1-year follow-up after surgery. A careful refraction is critical after implanting the telescope. Autorefractors and retinoscopy are not possible with the IMT. Because patients have a central vision of about 50 degrees, they may not adapt to a bifocal; therefore, a separate pair of distance and reading glasses may be used successfully. Another possibility is a very high bifocal for only the IMT eye so that patients may adjust the position only slightly to view through the bifocal prescription. 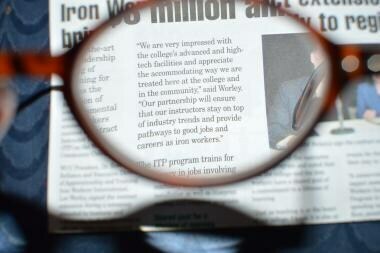 Other low vision devices, such as magnifiers and high-power reading glasses, may be used in conjunction with the IMT. Coordinating the monovision aspect (ie, one eye for peripheral vision and the other eye for detailed vision) is also challenging. Patients may seem to understand this concept prior to surgery, but they may later comment that they cannot get their 2 eyes to work together. Coordination of care is critical so that patients have the appropriate glasses and other magnification tools to ensure a successful outcome. This multidisciplinary approach includes rehabilitation efforts both before and after surgery. Occupational therapy practitioners working with persons with vision loss focus on increasing the person's level of independence with activities of daily living that have been compromised by visual impairment. The services can be provided in a clinic setting or in the person's home or work environment. Occupational therapists work with persons with age-related macular degeneration, diabetic retinopathy, glaucoma, retinitis pigmentosa, cataracts, visual field deficits from CVA, and traumatic brain injuries. Occupational therapists train people in the use of the prescribed optical devices (eg, high power readers, magnifiers, telescopes, microscopes, video magnifiers) to successfully integrate the devices into daily livings tasks and activities. Difficulty with reading is the most noticeable result of vision loss. Tasks that present the greatest challenge are those that have low contrast features or small print. Chadha RK, Subramanian A. The effect of visual impairment on quality of life of children aged 3-16 years. Br J Ophthalmol. 2011 May. 95(5):642-5. [Medline]. Thomas R, Barker L, Rubin G, Dahlmann-Noor A. Assistive technology for children and young people with low vision. Cochrane Database Syst Rev. 2015 Jun 18. 6:CD011350. [Medline]. Berger S, McAteer J, Schreier K, Kaldenberg J. Occupational therapy interventions to improve leisure and social participation for older adults with low vision: a systematic review. Am J Occup Ther. 2013 May-Jun. 67 (3):303-11. [Medline]. Bittner AK, Wykstra SL, Yoshinaga PD, Li T. Telerehabilitation for people with low vision. Cochrane Database Syst Rev. 2015 Aug 31. 8:CD011019. [Medline]. van Rheede JJ, Wilson IR, Qian RI, Downes SM, Kennard C, Hicks SL. Improving Mobility Performance in Low Vision With a Distance-Based Representation of the Visual Scene. Invest Ophthalmol Vis Sci. 2015 Jul. 56 (8):4802-9. [Medline]. Lane SS. Latest AMD advance is in the hands of cataract surgeons. Cataract & Refractive Surgery Today. August 2005. 79-82. VisionCare Ophthalmic Technologies, Inc. Implanatable Miniature Telescope (IMT) for AMD and Stargardt’s Disease. Updated December 28, 2007. Macular Degeneration Support. Available at http://www.mdsupport.org/library/imt.html. Arnold RW. Use of a consumer video system to enhance low vision in children and adults. J Pediatr Ophthalmol Strabismus. 2002 Jul-Aug. 39(4):245-7. [Medline]. Faye. Clinical Low Vision. Boston: Little, Brown & Co; 1984. Griffin-Shirley. American Foundation for the Blind. Prescriptions for Independence. New York: 1993. Jose. Understanding Low Vision. New York: American Foundation for the Blind; 1994. Moore. Foundations of Rehabilitation Counseling With Persons who are Blind or Visually Impaired. New Yor: American Foundation for the Blind; 1997. Peli E. The optical functional advantages of an intraocular low-vision telescope. Optom Vis Sci. 2002 Apr. 79(4):225-33. [Medline]. Peterson RC, Wolffsohn JS, Rubinstein M, Lowe J. Benefits of electronic vision enhancement systems (EVES) for the visually impaired. Am J Ophthalmol. 2003 Dec. 136(6):1129-35. [Medline]. Rosenthal. Functional Assessment of Low Vision. Mosby: St. Louis; 1996. Townsend W. What's new and improved in low vision devices?. Review of Optometry. 2001. 138(9):61-64, 66-67. Wolffsohn JS, Peterson RC. A review of current knowledge on Electronic Vision Enhancement Systems for the visually impaired. Ophthalmic Physiol Opt. 2003 Jan. 23(1):35-42. [Medline]. Fast Five Quiz: Can You Treat Waldenström Macroglobulinemia?